Does this week seem like it’s crawling by to anyone else? Maybe it’s because it looks like it’s going to be a beautiful weekend here in Baltimore and I’m planning on spending as much time outside as possible. I’ll be playing tennis with my mom, going to a Father’s Day cookout and hopefully picking up some veggies for the week at the farmer’s market. I also signed up for the Baltimore Women’s Classic 5k that takes place around Federal Hill next Sunday the 28th so I’m hoping to do a practice run this weekend. 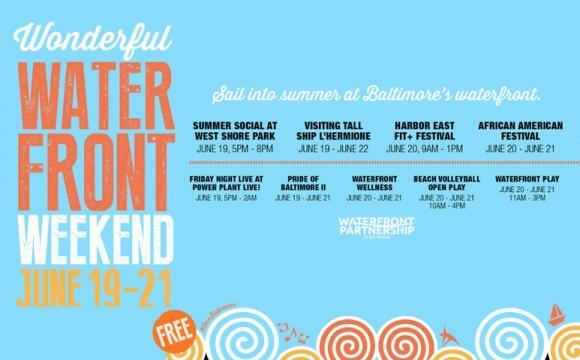 It’s also Wonderful Waterfront Weekend – a summer kick-off put on by the Waterfront Partnership of Baltimore. 1. Summer Social at West Shore Park – unfortunately I already have plans to be in Virginia Friday night because this Summer Social looks awesome. There will be live music, food trucks and beer & wine. It’s also a family friendly event with activities for kids. Two other summer socials are scheduled for July 24 and August 21 so I’ll try to make it to one of those! 2. Harbor East FIT + Festival – From 9-1 on Saturday on Aliceanna Street in Harbor East there will be complimentary group fitness classes and healthy food demos. Classes include zumba, boxing, boot camp and yoga. You can rsvp (for free) at the link above and buy a cute tank top with proceeds going to Living Classroom. I love group fitness classes, but the gym I belong to doesn’t have them so this sounds like such a fun opportunity to try a bunch of classes, enjoy the beautiful weather and work up a sweat with fellow Baltimoreans. 3. African American Festival – This is a huge free two day festival held outside Camden Yards that includes a health and wellness pavilion, a beauty bar and a beer garden. There is also a Black Enterprise Empowerment Zone with a special forum on #blackmalesmatter. This seems like a great opportunity to discuss an issue that is affecting so many in Baltimore. Bonus – former Raven, Ray Lewis is said to be a special guest! 4. 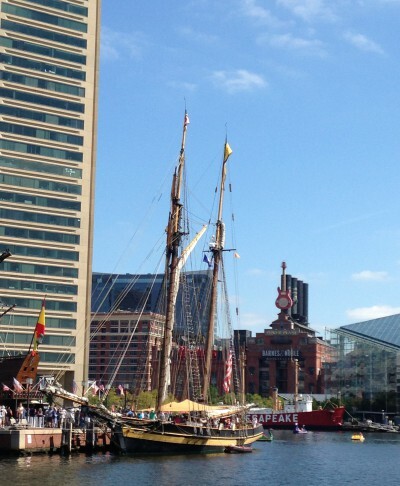 L’Hermione and the Pride of Baltimore II – I LOVE when the ships come into the harbor. I walk through the harbor every day on my way to work and it’s easy to forget that it is a working harbor and the rich history of the city. When the tall ships come in it just reminds me of an earlier time and I love it when the port is bustling. Free public tours, demos and reenactments will occur on the Hermione throughout the weekend. Checkout this schedule for details!